You guyssssss. I did it again. 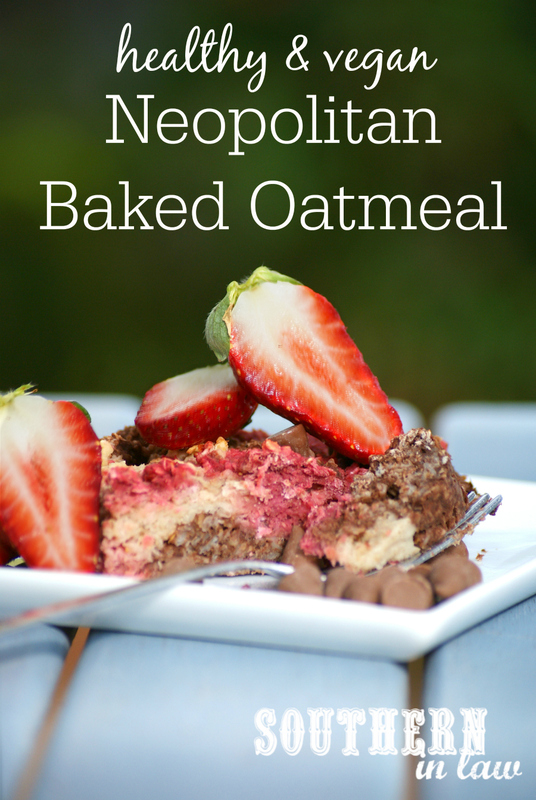 I'm sharing yet another baked oatmeal recipe - but for good reason! You see, this one is not only ridiculously delicious; it's also quite impressive. 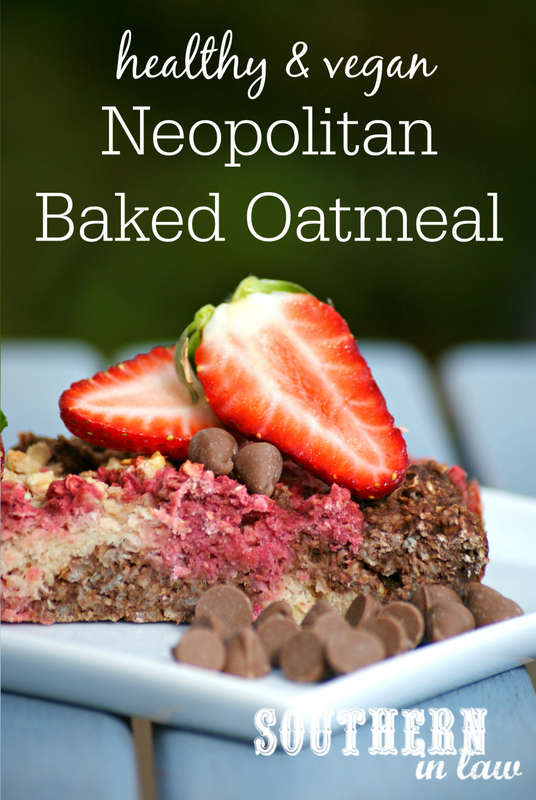 It's not your everyday baked oatmeal. 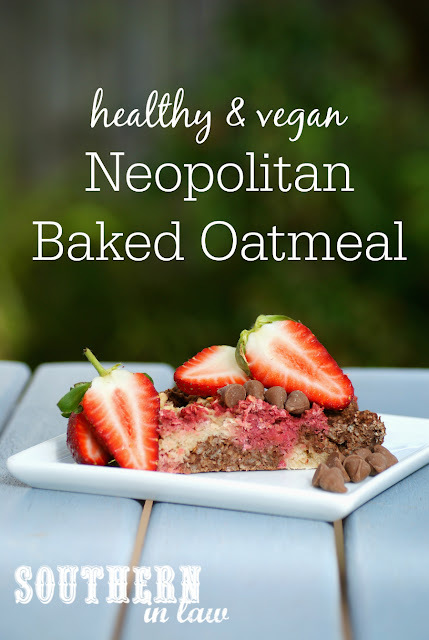 It's got a mix of vanilla baked oatmeal, chocolate baked oatmeal and fresh strawberry baked oatmeal - all combined to create a dessert inspired breakfast creation. This Neopolitan Baked Oatmeal is actually a million times easier than it looks and probably a thousand times more delicious. And really, who doesn't want to eat dessert for breakfast? Best of all? After a quick 15 minutes in the oven, you'll have a delicious breakfast ready to devour or slice and pack away to enjoy later. It's delicious on its own or smothered with toppings and even kids will happily devour it (the pink seems to be the magic trick here, friends) without knowing it's good for them. Just like all of my other baked oatmeal recipes, we make this one up and slice it up to freeze for later. When you're ready to eat, all you've got to do is defrost a slice (we do this by leaving a slice in the fridge overnight) and devour! Whether you want to eat it hot or cold is totally up to you, however, you need to try making it at least once. Line an 8x8" or 9x13" (depending on how thick you want yours) with baking paper and set aside. For the Vanilla Batter: Mix together all of your ingredients in a small bowl and set aside. For the Chocolate Batter: Mix together all of your ingredients in a small bowl and set aside. For the Strawberry Batter: Blend your strawberries with your milk, maple syrup, beetroot powder (if using) until smooth. Mix your strawberry milk mix with your oats and baking powder until combined, adding a small amount of extra milk if needed. Dollop your oatmeal batters into your prepared tin, alternating batters so you have a mix of flavours. Once all of your oatmeal is in the tin, tap the tin on the counter to smooth out the mix. If needed, smooth the mixture with a knife or spatula to ensure it's evenly spread. Bake for 15-20 minutes or until cooked through (baking time will vary depending on the thickness of your baked oats). Allow to cool before slicing and serving. Enjoy on its own or with toppings of your choice. This recipe will keep for up to a week in the fridge or individual slices can be frozen (in individual zip lock bags) and defrosted whenever you want a piece. *Find out more about oats on a gluten free diet. If you can't eat/don't have oats, feel free to replace them with quinoa flakes, however, remember the taste will be different! We'd suggest adding a little extra sweetener as quinoa flakes can be a little bit bitter. **Use more/less maple syrup depending on how sweet you like things. Alternatively this can be replaced with stevia/honey/sugar etc. We use 1 tbsp as we top ours with sweet toppings and don't like our breakfasts overly sweet. 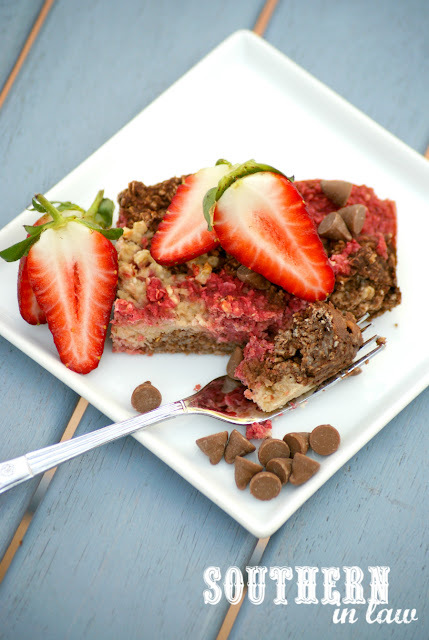 But tell me, is there a dessert you'd love to see turned into a healthy breakfast creation? And what's one food you can't stop making? Oatmeal? Baked Oatmeal? Smoothies? Pasta? Salads? Soup? What can't you get enough of?